Athens 1944: Not Churchill’s Finest Hour? Hmm…. A r ead­er writes: “Rather late in the day, I have been read­ing The Spec­ta­tor (UK) Christ­mas Spe­cial dat­ed 15/21/29 Decem­ber 2018. Page 28 refers to one Ron­nie Boyd, who had been a teenage Ordi­nary Sea­man aboard HMS Ajax in Decem­ber 1944, when Win­ston Churchill arrived in Athens to try to end the ongo­ing civ­il war. On Christ­mas eve 1944, Prime Min­is­ter Win­ston Churchill left fam­i­ly cel­e­bra­tions and flew to Athens to medi­ate the Greek civ­il war. 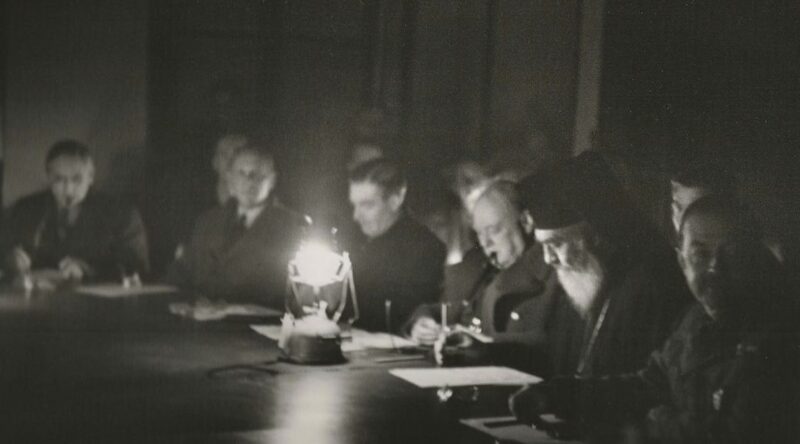 Com­mu­nists and roy­al­ists were fight­ing it out, but, armed with one promise Josef Stal­in actu­al­ly kept, Churchill thought he could give Greece a chance at democ­ra­cy.